Exposure to high levels of fluoride results in a condition known as fluorosis, in which tooth enamel becomes discolored. The condition can eventually lead to badly damaged teeth. The new study found that fluoride intake during a child's first few years of life is significantly associated with fluorosis, and warned against using fluoridated water in infant formula. "Recent evidence suggests that mixing powdered or liquid infant formula concentrate with fluoridated water on a regular basis may increase the chance of a child developing ... enamel fluorosis." It was 2007 when the American Dental Association (ADA) first warned that parents of infants younger than a year old "should consider using water that has no or low levels of fluoride" when mixing baby formula, due to concerns about fluorosis. "Results suggest that prevalence of mild dental fluorosis could be reduced by avoiding ingestion of large quantities of fluoride from reconstituted powdered concentrate infant formula and fluoridated dentifrice." "In children younger than 8 years of age, combined fluoride exposure from all sources—water, food, toothpaste, mouth rinse, or other products—contributes to enamel fluorosis." This is as far as the CDC warnings go, however, and they continue to state that water fluoridation is safe -- and dental fluorosis is only a "cosmetic" problem. In reality, neither of these assertions is true. Dental fluorosis results in white and brown spots on your teeth. It is only caused by fluoride -- typically due to ingesting too much fluoride during your developing years, from birth to about 8 years of age. According to the CDC, about one-third of U.S. children aged 12 to 15 years have very mild to mild forms of enamel fluorosis on their teeth. Promoters of fluoridation say that these markings are "just cosmetic," but it can also be an indication that the rest of your body, such as your bones and the rest of your organs, including your brain, has been exposed to too much fluoride also. The teeth are the window to the bones. If you've seen the damage to the teeth, what damage can you not see?" In other words, if fluoride is having a detrimental, visual effect on the surface of your teeth, you can be virtually guaranteed that it's also damaging something else inside your body, such as your bones. You typically don't find dental caries in more primitive societies that do not consume vast amounts of sugar like in the United States. One of dentist Bill Osmunson's main concerns is water fluoridation for infants. The ADA and the CDC now both recommend that infants NOT receive fluoridated water for drinking, nor for making their formula, as fluoridated water contains 250 times more fluoride than mother's milk. 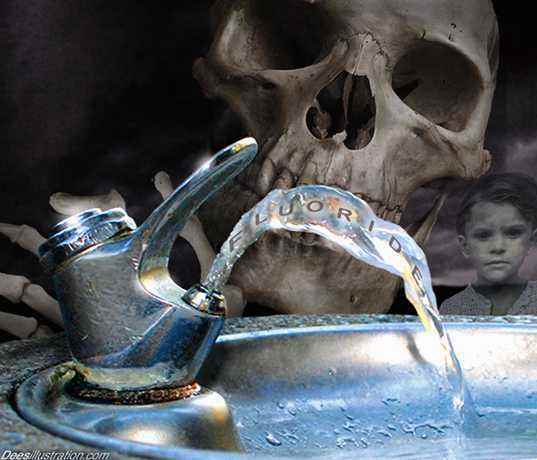 "We shouldn't fluoridate water and harm our most vulnerable," Dr. Osmunson says. Remember that most bottled water also typically contains fluoride, even though it's not stated on the label, and whatever you do, avoid using "nursery water," which is fluoridated water sold specifically for infants. Fluoride in your drinking water is one more reason why breastfeeding your infant is so essential. Nature has kept breast milk virtually fluoride-free for a reason. Not only that, but by fluoridating the municipal water supply you doom many low-income families to fail to protect their young children from this dangerous drug, even if they have this information, as they simply don't have the resources to install a reverse osmosis system. The Fluoride Action Network is an absolutely phenomenal resource for further education, and they're doing much to pressure the US government for change. We will be working together to devise a complete game plan to tackle this issue head on. Once we reach the tipping point, which may be as little as 5 percent of the population, we will be able to reverse the policies of water fluoridation. In addition, I highly recommend getting a copy of Dr. Connett's new book, The Case Against Fluoride, for more information on the bad science and political agendas that got this toxic chemical in our drinking water and is, at least for now, keeping it there.